"And this is the victory that has overcome the world--our faith" (1 John 5:4). We all know what it is to have bad days and unfortunate moments in our life. However, few of us will ever have to face anything worse than the series of tragedies that occurred in the past to a Christian couple in Chicago... Horatio, age 43, and his wife, Anna, age 29. Horatio was a successful businessman and church elder when an unexpected illness brought the death of his 4 year old little boy, Horatio Jr. And before he and Anna could even recover from the grief of this loss, another sudden tragedy occurred... a devastating fire that destroyed Horatio's business and financial interests. The family literally lost everything they owned and had to start over. Then less than two years later, while planning a trip abroad with his wife and four daughters, Horatio was delayed and he sent his family on ahead by ship... only to learn a short time later that the vessel collided with another in the Atlantic and sank. His wife was one of only twenty-seven out of several hundred passengers who survived... while all four daughters drowned. I cannot imagine the devastating loss and grief that these parents endured over this short period. It's a sad and painful thing to even recount this true story and think of the unimaginable grief they bore. However, despite this catastrophe, they both remained steadfast, clinging to their faith in God. This grieving father was able to attest to a peace in his soul, not because of the tragic circumstances, but from his greater abiding trust and confidence in God. It is well... it is well, with my soul. This kind of peace� and inner wellness� refers to an inward disposition of faith, an attitude of victorious confidence that refuses to surrender our will to what appears as total defeat. While all appears to be lost, yet we trust in the unseen plan and purpose of the omnipotent God, in whom we have trusted our lives. He is in control, He is God almighty... and through Him, we will eventually rise above every adversity. 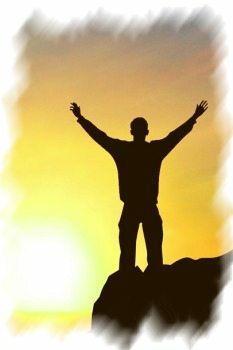 Victory� refers to that inner peace of God which surpasses all understanding (Phil. 4:7). It's the joy of the Lord which is our strength (Neh. 8:10). It is the that inner confidence that overcomes discouragement, doubt and unbelief. It is the assurance that God is in control, and as we love the Lord and live a life wholly consecrated to Him, we know all things and circumstances are somehow working together for our good. "And we know that all things work together for good to those who love God, to those who are the called according to His purpose" (Romans 8:28). God wants all his children to live a victorious life, however, this is only possible through the walk of faith. Faith is that which enables us overcome all the trials, adversities and circumstances of his world (1 John 5:4). A victorious life of faith no longer lives by feelings, emotions or circumstances. It is no longer manipulated by the emotions of discouragement or depression. As people of faith, we live and abide according to what the Word of God says, not by what the circumstances say. "We walk by faith and not by sight" (2 Cor. 5:7). This walk of faith is what brings victory. The scriptures teach that every Christian will face many trials and disappointments in this life and He promises to deliver us from them all. "Many are the afflictions of the righteous: but the LORD delivers him out of them all" (Psalms 34:19). However, we must understand, our deliverance and victory may not always mean the immediate alteration of our circumstances. God may not always choose, or be at liberty, to change some external circumstances immediately. Instead, He will change YOU internally so that you can "endure" the circumstances. This is what Paul meant when he said he could be "content" regardless of what state he found himself (Phil. 4:11). Despite our circumstances, we can have victory and peace in our heart, with the patience to endure until He alters our situation. One Christian wife cried continually to the Lord about her alcoholic husband. She could not bear the continual heartache, the strife and embarrassment. She urgently prayed that God would transform the man and heal her marriage. God also wanted to change that man, but He will not force anyone to serve him. So since the wife had no biblical grounds for divorce, she had to learn to endure and be patient for God to deal with the husband's heart. In this situation, her deliverance came internally as the Lord relieved her burden. He protected her from physical abuse and gave her peace and joy in her heart. Today her husband has still not turned to the Lord, but her peace and joy is no longer postponed to a future time when he might change. She lives each day in victory -- with God's peace and joy rooted firmly in her heart. God does not bring evil upon us (James 1:17), but sometimes, for His specific purposes, He has placed persons in challenging situations for the cause of Christ. And in other situations, it may be just a matter of time for the Lord to change our circumstances. But in the meantime, you can find peace and refuge in His presence. "The Lord also will be a refuge for the oppressed, A refuge in times of trouble" (Psalms 9:9). God promised to make a way of "escape" in the midst of distress, enabling us to "bear" certain temptations or trials. "No temptation has overtaken you except such as is common to man; but God is faithful, who will not allow you to be tempted beyond what you are able, but with the temptation will also make the way of escape, that you may be able to bear it" (1 Corinthians 10:13). That way of "escape" is the presence and peace of God which abides in us to give us victory in the midst of the conflict - peace in the middle of turmoil. The presence of God in our life enables us to "bear" certain hardships and difficulties. And notice that it says He will not allow you endure an ordeal beyond your ability. That's something to always remember. Perhaps there is no one who knew how to live the victorious life better than the Apostle Paul. He was a man of great faith and strength with God, but he endured circumstances that were almost unbelievable. He wrote of his ordeals in the ministry: "...in labors more abundant, in stripes above measure, in prisons more frequently, in deaths often. From the Jews five times I received forty stripes minus one. Three times I was beaten with rods; once I was stoned; three times I was shipwrecked; a night and a day I have been in the deep; in journeys often, in perils of waters, in perils of robbers, in perils of my own countrymen, in perils of the Gentiles, in perils in the city, in perils in the wilderness, in perils in the sea, in perils among false brethren; in weariness and toil, in sleeplessness often, in hunger and thirst, in fastings often, in cold and nakedness-- besides the other things, what comes upon me daily: my deep concern for all the churches" (2 Corinthians 11:23-28). Despite his tribulations, Paul didn't lose sight of his victory. He wrote, "We are hard pressed on every side, yet not crushed; we are perplexed, but not in despair; persecuted, but not forsaken; struck down, but not destroyed" (2 Corinthians 4:8-9). Paul's life and ministry were filled with tremendous hardship, but his attitude remained confident and resisted defeat. "...But thanks be to God, who gives us the victory through our Lord Jesus Christ" (1 Corinthians 15:57). You can live in Victory, Not in Defeat! If you are facing trying situations, don't allow them to rob you of your victory! The Bible tells us that "God is our refuge and strength, A very present help in trouble" (Psalms 46:1). You are not alone. Jesus has promised to never leave you nor forsake you (Heb. 12:13). Turn your attention to Him and His Word. Wait upon Him and He will strengthen you with His peace. "You will keep him in perfect peace, Whose mind is stayed on You, Because he trusts in You" (Isaiah 26:3). By faith, release your cares, your concerns and worries to Him. Trust Him to work out the end result. He will either change your circumstance or will change you to deal with them! Take His rest and peace upon you, believing that He has taken the burden from you. "Cast all your cares upon him because he cares for you" (1 Peter 5:7). Remember and follow the Apostle Paul's example. He knew adversity at its worst, but also knew that circumstances need never threaten the joy and victory of the believer. He wrote, "Who shall separate us from the love of Christ? Shall tribulation, or distress, or persecution, or famine, or nakedness, or peril, or sword? ...Yet in all these things we are more than conquerors through Him who loved us" (Romans 8:35,37). This article (VL-137) is copyrighted © by Dr. Dale A. Robbins, 1990-2019 and is a publication of Victorious Publications, Grass Valley, CA - Nashville, TN. Unless otherwise stated, all scripture references were taken from The New King James Bible, © Thomas Nelson Inc., 1982. You may download this article for personal use as long as you retain credit to the author. Obtain permission before reproducing copies for any reason, by filling out our simple use permission form. Many of our writings are also available as free pdf tri-fold pamphlets, which can be downloaded for reproduction from our Online Catalog. For media reproduction rights, or to obtain quantities of this title in other formats, email us. If you have appreciated these online materials, help us reach the world with the Gospel by considering a monthly or one-time tax-deductable donation.